﻿ Reps? Sets? Progressive Overload? Reps? Sets? Progressive Overload? Home / blog / Reps? Sets? Progressive Overload? Our bodies will not build muscle if they are not forced to do so. If you want to build muscle, you need to lift more weight. However, is impossible to gain muscle overnight, no matter what anyone tells you! You need to progressively add more weight in order for growth to be stimulated. This concept is true for any fitness goal. If you want to run a marathon, you need to progressively overload by adding more miles to your training over time. Eventually, you can get to 26.2 miles. If you want to increase your deadlift numbers, you need to do so by progressively placing more and more weight on the bar. The stimulus must be changing to continue placing stress on the body, which is why sets and reps matter. this is also why progressive overload is critical. Generally, if your goal is strength and muscle building, 3-5 sets of 3-5 sets works really well. You also need to vary up your rep schemes in order to get results, and this is where people get lost. If you are a beginner, it is recommended you focus on full body workouts that stick to 2-3 sets of 12-20 reps. This will get you to start building muscle. Do 2-3 workouts per week and hit the major muscle groups – Chest, Back, and Legs, with most of your work being centered on these lifts – Bench Press, Rows, Lat Pulldowns, Overhead Press, Squats, and Deadlifts. Notice bicep curls where not mentioned. If your goal at first is to lose weight and start to build muscle, why would you put focus on the one of the smallest muscles groups to do so? Bicep curls will show up later, when you can actually see changes from doing them. The first step is to focus on getting your body accustomed to working out and build some base muscle. You should have two to three workouts and switch between them. If you MUST do some bicep curls, do them at the end after hitting the bigger muscles first. More advanced lifters should switch workouts to 3-4 times per week and stick to an Upper/Lower split. Rep ranges can now dip into muscle building/strength ranges and you can incorporate exercises to isolate and target specific muscles – such as a bicep curl. Bigger muscles groups like chest and back should get the majority of the workout with about 8-12 sets per week and smaller muscles should get 0-8 sets per week. Another option is to do splits, where you work on different muscle groups on different days. There are several options you can do here. It is ideal to train legs two days per week, because you can stimulate a lot of muscle growth by doing so. If you use a split like the one above, you would keep the cycle moving for however many days per week you work out. 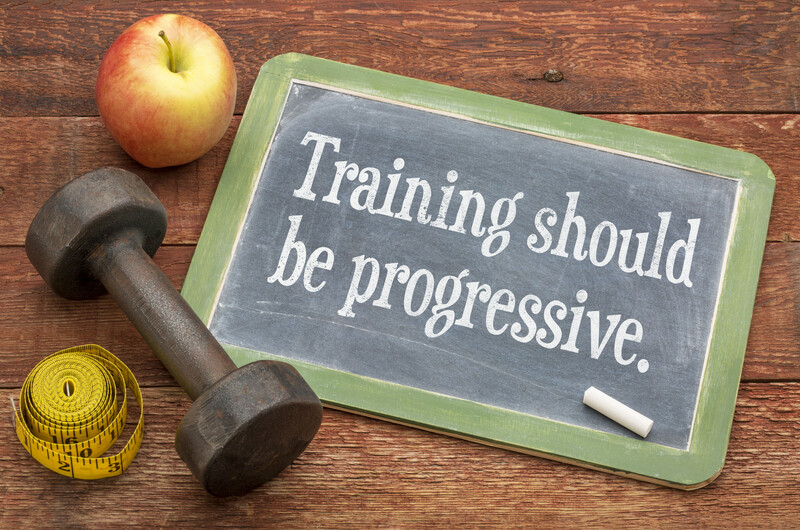 Whichever option you choose, progressive overload will get you the body you want as long as you have a plan in place. Looking to increase your reps, sets, or weight for strength training? Contact us to work with an expert trainer!